As you acquire trophies, where and how to display them becomes just as important as the hunting itself. It's not uncommon for a collection of trophies to outgrow their allotted space in your home or office. Reorganizing with dioramas, remodeling your existing space or even building new spaces are common solutions to this problem. Combining animals into dioramas or corner mountains is an easy way to clean up clutter and regain space for even more mounts or simply give your room a truly unique appearance. Our designers will assist you from conception to the finished product. It's not uncommon for homes to be remodeled or built to showcase a trophy room. Trophy rooms are specialized and very unique to each individual. Far to often people are disappointed with their new trophy room because the architect or builder doesn't have the experience to create a usable space or meet your expectations. Taxidermy Unlimited is a great partner on your construction team. We can assist you from conception to working with your architect and builder so you're assured the trophy room of your dreams. Mountains and mountain ranges look incredible while offering great flexibility for displaying your trophies. Dioramas that place your trophies in their natural surroundings are very unique and maximize available space. 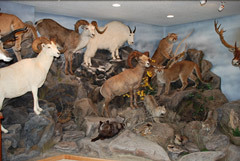 Custom murals, vegetation, trees, and art work all contribute to an amazing trophy room. 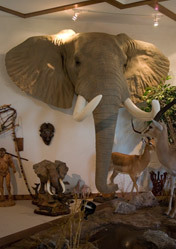 Our goal is to help you realize your dream trophy room, contact us at (952)890-8688 for additional information.